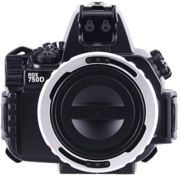 Related Information *The housing becomes compatible with EOS REBEL T1i/EOS 500D and REBEL XSi/450D by replacing the rubber button (accessory). Simply by connecting theFiber-Optic Cable (L-type)50107 to the connector, the light of the digital camera’s built-in flash is detected and connected to an external strobe. This is considerably less complicated than setting up an electrical connector that requires detailed knowledge. It also eliminates any risks involved when the connector is submerged in water. 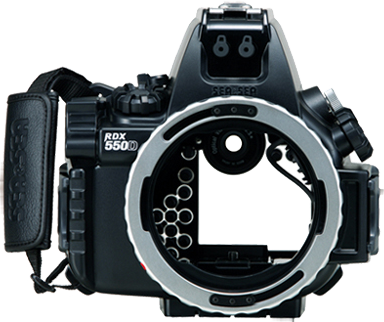 * Viewfinder retainer ring is required. Contact an official SEA&SEA dealer or distributor.